Due to these changes, this "Beta Version" of Book Three: Destruction is no longer the "official" version of the podiobook. Please visit the 7th Son: Descent (The Print Edition) page to subscribe to the definitive beginning of the trilogy. You're welcome to continue the series with this version of Destruction, but note that you will encounter slight inconsistencies in character names and plot references. THE STORY As day four in the 7th Son adventure begins, John Alpha's quest for anarchy and genocide enters its final stage. At every turn, the global terrorist has been triumphant. The world is reeling from a nuclear attack. An unprecedented energy crisis is upon us. Alpha himself has exclusive access to the White House, and secret weapons primed to propel his conspiracy into the endgame. The goal: planetary chaos. Amidst this turmoil, the 7th Son's four surviving Beta Clones – John, Father Thomas, Kilroy2.0 and Jack – must defy their creators and hunt Alpha on their terms. Their mission: to stop the greatest assassination plot in history. The secrets John and his brothers discover will press them toward a final battle with their progenitor … a battle in which the clones are outgunned, outnumbered and out of time. Alliances will be made. Heroes will die. The end is nigh. Destruction is the final novel in the J.C. Hutchins' 7th Son thriller trilogy. We will send 7th Son: Book Three - Destruction (The Beta Version) to your Kindle at . 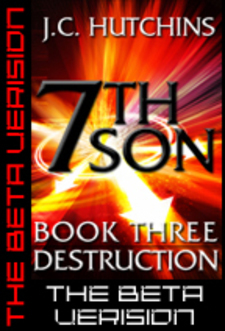 7th Son: Book Three - Destruction (The Beta Version) has been sent successfully to your Kindle!